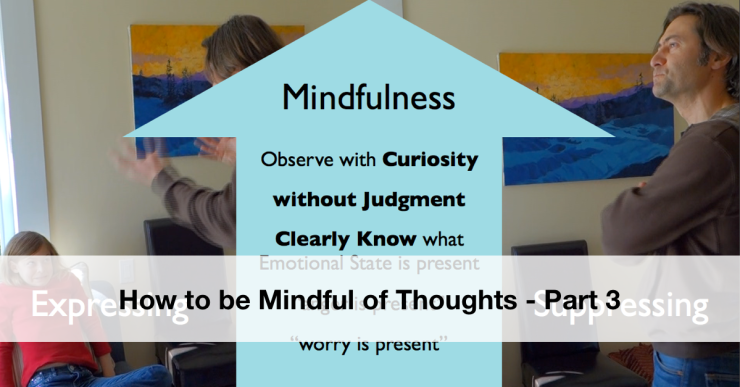 We’ve reached the third and final instalment of the “How to be Mindful of Thoughts” series. In part 1, I showed you how to work with thoughts by simply observing them as mental objects, without getting sucked into their content. Then in part 2 I gave you some strategies for handling emotionally charged thoughts, without getting overwhelmed by them. Now it’s time to go deeper and get at the moods or mental states that underly our thoughts, so we can begin to deal with those pesky repetitive thoughts that keep bugging us, or the ones that compel us to react to their content in ways we later regret. This is where mindfulness really saves the day! If you liked this video, you may want to have a look at part 1 and part 2. P.S. 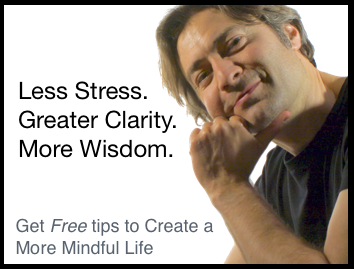 If you like this kind of stuff and want to discover how to develop mindfulness effectively and apply it in a simple, straightforward way, then you may be interested in signing up for my weekly blog updates. P.P.S. If you prefer reading to watching videos, I’ve included the full transcript below (but you’re missing out on some amazing low-budget special effects =-) ). So far in this video series about how to be mindful of thoughts, you learned how to work with thoughts as just mental objects that can be observed, rather than as things to drive you crazy, and last time, I showed you some strategies for dancing with emotionally charged thoughts both on and off the cushion, to help you get some freedom from them. Now we’re going to go deeper, and learn how to work with the moods or emotional states of mind that underlie these thoughts. So, let’s dive right in! N: Emily, I noticed that you’re reading a novel. Have you finished your homework? E: Yah, I know, but I’m at the most exciting part right now. I’ll do my homework, I promise, just as soon as I finish this chapter. N: Ok. Remember, you promised. N: Emily, I thought you said you were going to do your homework after finishing the chapter. It’s been an hour. You must have finished it by now. N: Uh huh, what is it? E: Well, um, I kind of forgot to bring my homework home. N: Again!? Emily, you’ve forgotten your homework 3 days in a row now! What’s going on? E: Dad, you seem upset. N: Ah, um, no, I’m not upset, I’m just trying to, um, motivate you to do your homework. Ok. So what just happened here? Why did I suddenly lose it? To find the answer, let’s go back a little and take a look into my mind and see what’s going on in there. Here, at the point where I realize that Emily has left her homework at school again, there’s a stream of thoughts going through my mind. These thoughts crescendo into that totally unhelpful, angry reaction I had. Now, where are all these thoughts coming from? If you look under the surface of the mind, beneath all the thoughts racing around, you’ll notice an underlying mood or emotional state. In this case, the underlying emotional state was anger. But that’s not the whole story. Anger is usually a bit of a red herring. If you go a little deeper, you’ll see that, in my case, under the anger is a layer of worrying. That’s the real source of these particular thoughts. When I get worried, I tend to express that concern through anger. So, when being mindful of thoughts, especially repetitive ones that just won’t leave you alone, or emotionally charged ones that cause you to react, it can be helpful to see if you can get beneath the thoughts, like I’ve done here, to the underlying emotional state. See if you can discover what’s really going on down there. But remember, we’re not doing psychotherapy here. This isn’t about getting involved in the content or narrative of the thoughts, or engaging in any way with the underlying emotional state. We’re not even particularly interested in the origin of that emotional state or what it means that it’s there. Leave the content alone and try your best to observe the thoughts and their underlying emotional state with acceptance and equanimity. See if you can just watch them without getting involved, without identifying with them as my thoughts or my mood. Now, there’s some other interesting things going on here as well. Let’s have another peek and I’ll show you what I mean. N: Again! Emily, you’ve forgotten your homework 3 days in a row now! What’s going on? N: Ah, um, no, I’m not upset, just concerned that you’re not getting your homework done. The way we most commonly react to these emotional states is by either expressing them or suppressing them, and I’ve actually done both here in this example. First, I expressed my worry and anger at my daughter, and then, when she called me on it, I suppressed and denied it. Being mindful of emotional states is a middle path between expression and suppression. Instead of enacting the emotional state to escape from it’s unpleasantness, or suppressing the emotional state because it contradicts our idea of who we are or should be, we observe, with curiosity and honesty what’s actually going on in our mind, without judgment. You try to clearly know what your underlying emotional state is. And to do this, it can be really helpful to mentally label the state. Ah, anger is present. Worry is present. Or whatever it happens to be for you. This helps to down-regulate an area of the brain called the amygdala, which makes the mood feel less intense and more manageable. When you can do that, even if it’s just for a moment or two, there’s no longer as strong a compulsion to express that emotional state or suppress it. You get the space you need to let it dissolve away on it’s own and respond more skillfully to the situation at hand. And this is where all that meditation training begins to bear fruit. By training yourself to not instantly react to pleasant or unpleasant sensations in the safe and controlled conditions of your meditation practice, you develop the mindfulness skills that allow you to carry that non-reactivity into your daily life, which is the whole point. That’s it for this video. I hope you enjoyed watching it and learned some new approaches for working with the underlying moods or emotional states in your mind. This also concludes my 3 part video series on how to be mindful of thoughts. If you like this kind of stuff, you can subscribe to my channel here on youtube so you get updates each week when I release a new video. I’m Nick Grabovac, Thanks so much for watching.